Courtesy Monarch Butterflies gathering on an Oyamel tree. Every year around Dia de los Muertos, the residents in the central Mexican town of Donaciano Ojeda adorn the streets and quietly wait for the spirits of loved ones to arrive. According to some locals, whether or not the spirits come is up to God. But the autumn winds are certain to be filled with another kind of life: 33 million monarch butterflies. But that number is a small fraction of the once-billion monarch butterflies that make their seasonal migration from the northern United States into Mexico. 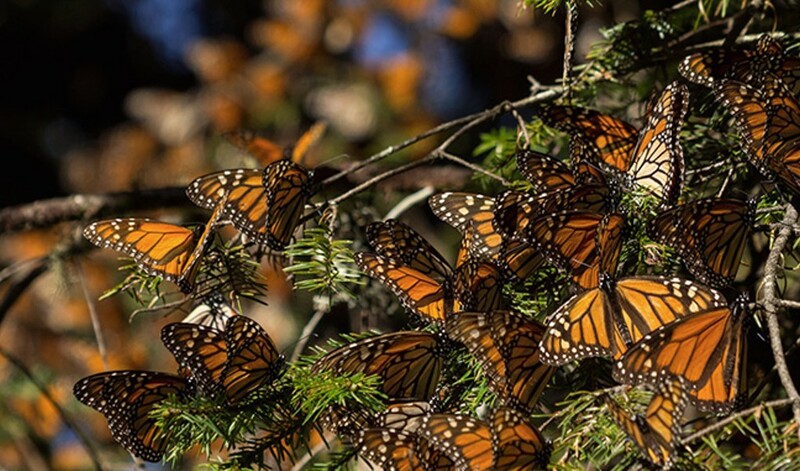 Deforestation in Latin America is partially to blame for this mass die-off, and groups of Mexicans are banding together to protect the surviving forests, both for themselves and for the monarchs. One such group, the locals of Donaciano Ojeda, are the subject of the new documentary, The Guardians. Filmmakers Tessa Moran and Ben Crosbie took six trips to Mexico over three years, telling what they originally thought would be an mainly environmental tale. "Early on, we expected that the community had this really deep connection with the butterflies that they wanted to protect." Moran says. "But the reality is they're protecting the forest for their own survival. It's a privileged position to be able to care about another species." Donaciano Ojeda locals replanting trees. Shot around the Monarch Butterfly Biosphere Reserve, The Guardians' two main subjects, Santos and Aristeo, once worked as loggers, but have since made the decision to fight for regrowth. 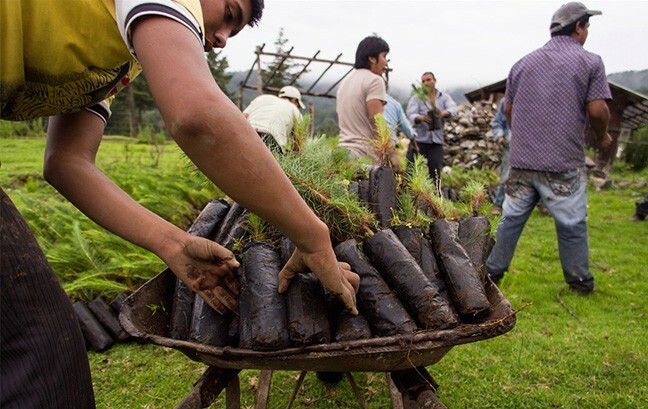 Alongside other farmers, they plant trees, maintain a 24-hour armed guard of the forest against illegal logging, and discuss the difficulties of this new lifestyle at town council meetings. "In that first meeting we went to, Tess and I were really nervous." Crosbie says. "They wanted to know everything about why we were there. But after an hour they found out we were harmless." Crosbie and Moran found that the community relies on the forest, and in turn, the forest relies on the community; the trees preserve the water sources trickling into the town's valley, and the locals venture into the forest to plant the saplings they've been growing all year. "The way it's presented, we didn't even have to do much editing," Crosbie says. "We just let it play out." "It was scary. You are not afraid, but I am very fearful." "Afraid of dying? You have to die." "It's not death I'm afraid of. The train can take us when it comes. But the problem was that it was damaging the corn." The work is difficult, and not as lucrative as logging. But the dwindling-yet-gorgeous clusters of monarch butterflies serve as the perfect representations for the community's hopes of preservation. "It was just an absolutely beautiful moment in time," Moran says. "Having the monarchs coming into town, we knew we had these connective tissues between the two communities." This rural, migratory tale is made even more affecting by the movie's cross-national soundtrack, performed by Tucson's own indie-rock band Calexico. "There's a real sense of place in those very rural mountains of Mexico that gave me some inspiration," says Joey Burns, vocalist and guitarist for Calexico. "We were really excited to do the soundtrack. We really liked their story." The Latin-inspired strings are sparse enough to evoke the forests and hills, but impressionistic and refined, adding a bit of humanity into the mix. "I love the parallels between the humans and the insects," Burns says. "We all move, it's a natural thing. They captured a really important point beautifully." Calexico actually recorded more music than was originally intended for the movie, partially due to being inspired by the film, and partially due to personal investment in the subject: Burns and his family cultivate plants to help the passing butterflies. "I really like working with independent filmmakers because it's a chance to work one-on-one with the directors." Burns says. "You're able to say, 'Hey, how do you feel about this?' And as a result the soundtrack got very minimal and intimate." Although the film's subjects are fighting an uphill battle toward an uncertain future, they are very conscious of the fact they won't be the ones to reap the benefits of the work. Trees grow slowly, as do the recovering butterfly populations. But the ultimate goal isn't simply to regrow a forest, it's to provide for the future generations, and to pass onto them a better world by teaching them to value this one. Because, as Santos says, it is not his generation, but the youth, who are the owners of the forest.